On Monday 15 June, Muscular Dystrophy Australia (MDA) was awarded a $30,000 grant from the National Australia Bank to fund the 100th CampMDA which sees children and adults living with Muscular Dystrophy attend a week-long respite camp. 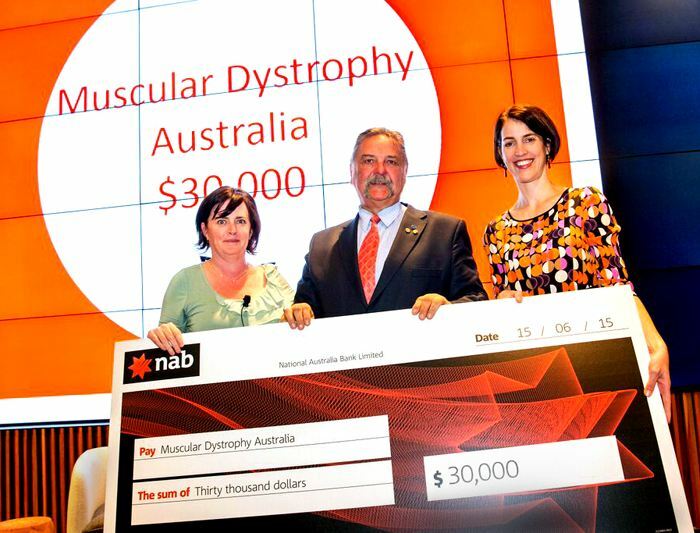 “It is a privilege receiving this honour and having the work of CampMDA recognised by such a prestigious organisation and we thank all of the NAB employees who voted for this wonderful cause,” said Muscular Dystrophy Australia’s Executive Director, Boris M Struk. The grant was made available through the NAB’s Community Engagement Program and MDA was selected through the Employees Choice Awards where staff voted on the winning charity via an internal intranet system. Mr Struk attended the award ceremony held in the Melbourne CBD along with the MDA Client Services Manager, Maria Kouppas, and was given the opportunity to network with the wide variety of recipients of the various grants. “CampMDA is a cornerstone service that MDA provides to those in the MD community and is one of the most important activities which MDA facilitates as it provides over 14,000 hours of respite per annum to families of those affected. “It is about providing a fun place where children, and adults, with MD can come and relax and have a wonderful time socialising and participating in exciting activities. “At the same time it also allows a break for the primary carers as it gives them some time to recharge their batteries and unwind while they know their loved one is being taken care of at CampMDA. “Celebrating the 100th camp is a huge achievement and we are so proud to be able to offer such an important service to the community and now, thanks to the grant, we can make it a spectacular event. “It is so important to provide our members with a fun week that can take their mind of such a serious condition. To see all of their smiling faces and hearing the cackle of laughs all day long really makes it all worthwhile,” said Mr Struk. All members of the MD community and the general public are invited to the 100th CampMDA Open Day celebrations being held in Bacchus Marsh on Sunday 27 September 2015, to register for the event call MDA on (03) 9320 9555.